A great guy stopped in a while back with a special challenge. He wanted something unusual to display a group of posters – “Do you have frames made of old barn wood?” Well, not exactly, but what were you visualizing? 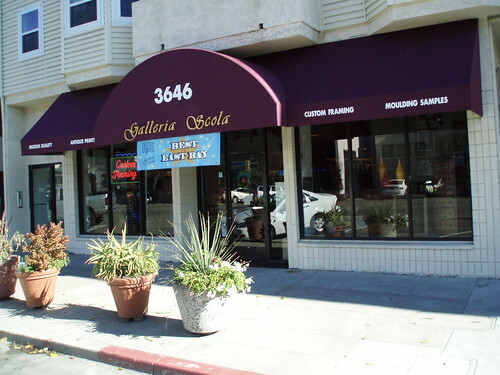 As we discussed further I came to find out he is Chris Pastena, owner of Chop Bar in downtown Oakland. He has done great projects with local artisans in many areas of the restaurant – the reclaimed wood on the walls, the bar area itself – all utilizing repurposed materials of all sorts. This is the kind of challenge we love! We brainstormed a bit more and landed on the idea of old windows. 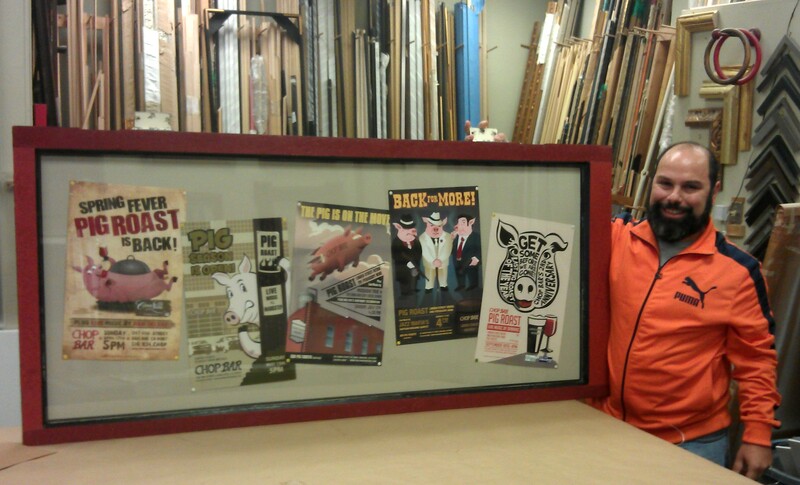 He has posters from the monthly pig roasts Chop Bar hosts in the Spring and Summer, so something quite sizable was in order. Chris went to a reuse center and found a wonderful long glassed door and pretty much said, “Go to town!” Great! 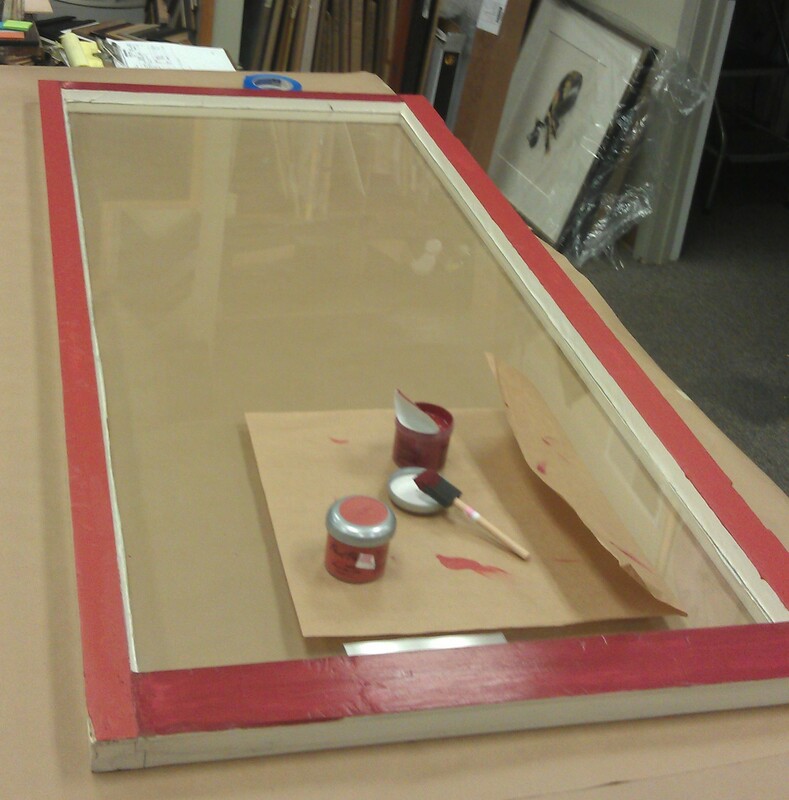 We started with the window – cleaned it up a bit and lightly sanded the painted frame. 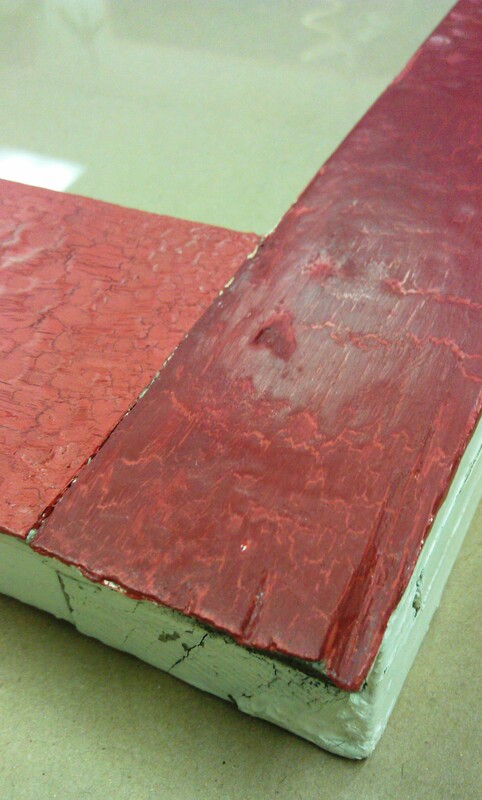 Then came the base coat for the crackle distressed finish we had decided upon. 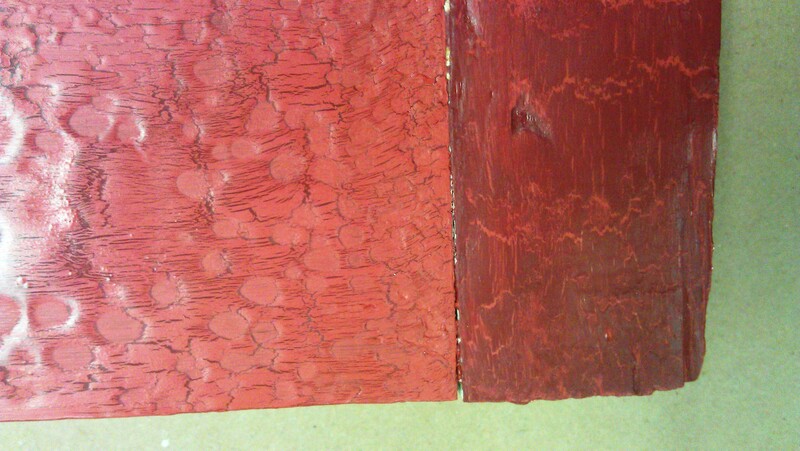 After the paint was dry, we applied a crackling medium which goes on very thick then settles itself into odd littel circles. 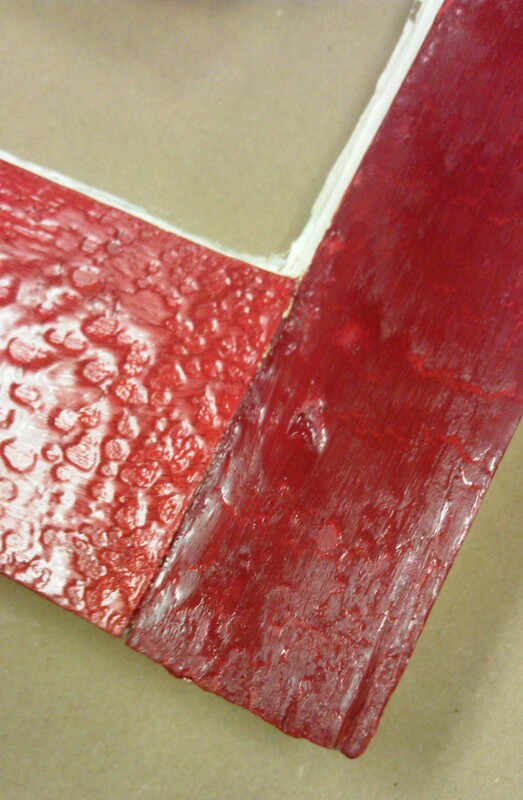 When that was set-up and almost completely dry, the top coat went on – then the magic happens! It begins to crackle! After about 24 hours, the cracks get even more pronounced. We used two related shades of paint and applied them oppositely on opposing legs of the frame – dark over light in one direction and light over dark in the other direction. We think it came out pretty darn great. To finish it off, we painted the outside and inside edges black to give the whole piece a little more depth, then mounted the posters onto an oversized matboard backing with thumbtacks. The piece hangs horizontally from the hardware that was formerly it’s door hinges. Chris was so delighted with the way it turned out, we had to take a photo of him with his new masterpiece! You can now see it proudly displayed at Chop Bar, and you will not regret stopping in for breakfast, lunch, dinner, or happy hour! And know that you are supporting a local dining treasure that is hosted by people who support local artists, food producers,and the local economy! Thank you Chris! This entry was posted on Wednesday, January 25th, 2012 at 7:02 pm	and tagged with crackle finish, creative, frame, hand-finished, Oakland and posted in Antiques, Art, Frames, Oakland, Shadow Box. You can follow any responses to this entry through the RSS 2.0 feed. I love your stuff. 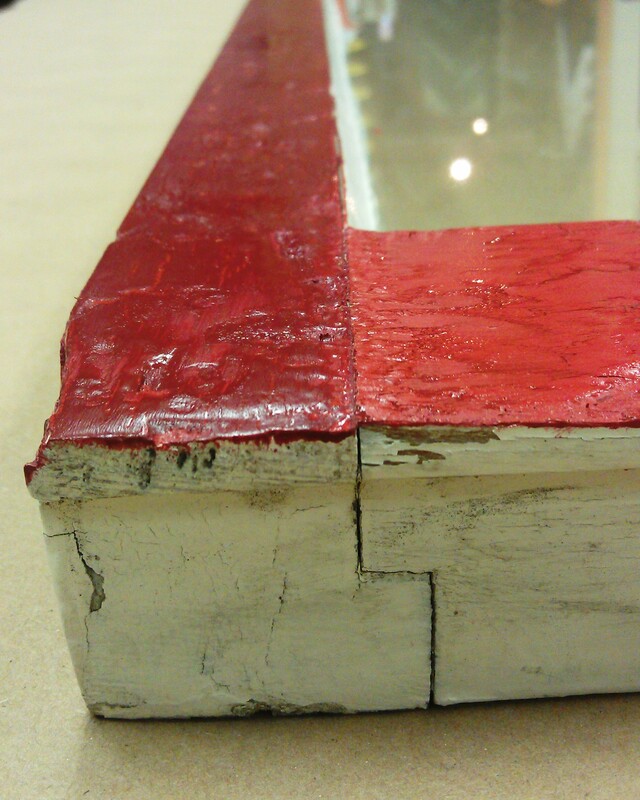 Just be really careful of that lead based paint dust when you’re working on those old doors and windows. Very good advice! Yes we were extremely careful to sand with a vacuum attachment also, so all the dust immediately goes away before it can be breathed. Luckily, we wanted it to be ‘chunky’ so we didn’t have to do much at all. 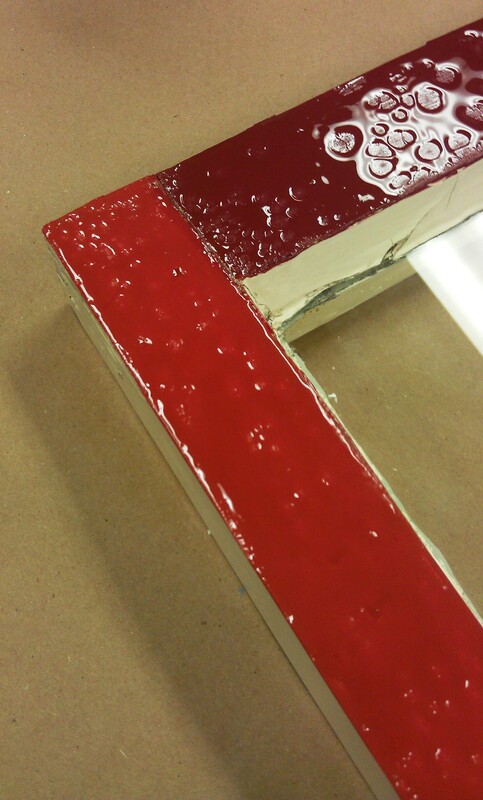 Another way to deal with a chippy frame would be to just varnish or shellac over it to seal everything in.